OneFitWonder Black bumper plates are manufactured to go toe to toe with any bumper plate on the market. They are constructed with virgin rubber formulated specifically for its durability, density and low bounce. Most importantly, they go through the most customer-focused manufacturing, quality control and shipping process in the industry so you can rest assured that you are getting the highest quality plates with and we are taking the utmost care to ensure they arrive to you in pristine condition! OneFitWonder bumpers are thinner than many of the competing bumpers- so you can load more weight on your bar! OneFitWonder bumpers all have the same standard diameter- you can mix and match to load your bar. 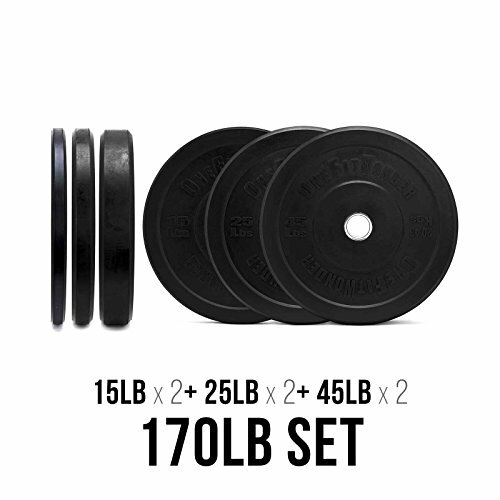 Bumper Plate Widths: 55's - 3.2", 45's - 2.9", 35's - 2.35", 25's - 1.87", 15's - 1.2", 10's - 1.05"
170lb set includes: 15lb, 25lb, and 45lb pairs. Thinner than many of the competing bumpers- so you can load more weight on your bar! OneFitWonder bumpers use a rubber formulation that combines the ideal mix of low bounce with high durability. Weight Tolerance +/- 1% of declared weight. Virgin Rubber for high durability plus stainless steel "hooked" insert. If you have any questions about this product by OneFitWonder, contact us by completing and submitting the form below. If you are looking for a specif part number, please include it with your message.